Kris Kristofferson playing at the Ryman Auditorium in Nashville. Kris Kristofferson is one of the greatest songwriters in the history of American music, though he may be better known to much of the public as a movie actor. From “Me and Bobby McGee,” made famous by Janis Joplin, to “Help Me Make It Through the Night,” “Sunday Morning Comin’ Down,” and many other songs, the intelligent and insightful lyrics of classic Kristofferson contrast with the depressingly frivolous content of much of today’s country and pop music. Most of Kris’s songs became known through recordings by other singers, but he has recorded fine albums of his own material through the years. American music—especially country music—is indeed fortunate to have had Kris Kristofferson. Kristoffer Kristofferson was born on June 22, 1936, in Brownsville, Texas. His father rose through the ranks of the U.S. Air Force to become a major general. The family moved to San Mateo, California, when Kris was in his early teens. He studied creative writing and poetry at Pomona College in Claremont, California, from which he graduated with honors in 1958. Upon being awarded a Rhodes scholarship, he moved to England to pursue a master’s degree in English literature at Oxford University. In his spare time, he wrote songs, sang at local clubs, and made some early recordings. After obtaining his master’s in 1960, he enlisted in the U.S. Army and was stationed in West Germany as a Ranger and helicopter pilot. In 1965, Captain Kristofferson was given a position as an English instructor at the U.S. Military Academy in West Point, New York. It seemed that the young man had achieved success in both the academic and military worlds. However, Kris shocked his military colleagues, his friends, and his family by withdrawing from the West Point position two weeks before he was to start. He quit the military and moved to Nashville, Tennessee, to seek success as a songwriter. After arriving in Music City in 1965, he was signed as a writer by a publishing company named Buckhorn Music. Kris met other writers in town, including Shel Silverstein, with whom he would sometimes collaborate. But to make a living for himself, his wife, and his two small children, the former Rhodes scholar had to work at various part-time jobs, including as a bartender and as a janitor at Columbia’s recording studio. Kris’s songs began to scale the charts for other singers in 1966, such as Dave Dudley, Roy Drusky, and Billy Walker. In 1969, Roger Miller released a version of Kris’s “Me and Bobby McGee” (written with Fred Foster) that broke into the top 20 on the country charts. A really big break came when Kris’s hero, Johnny Cash, showcased Kris on his television show. The determined Kristofferson had captured Cash’s attention by flying a helicopter onto Cash’s property and handing him a copy of “Sunday Morning Comin’ Down,” which the Man in Black soon recorded. Sammi Smith’s passionate version of Kris’s “Help Me Make It Through the Night,” which went to the top of the country charts in 1971. The song was posthumously released on her album Pearlin January 1971, and the single soared to the top of the pop charts in March 1971. Suddenly, everybody in the music business knew who Kris Kristofferson was. He became highly in demand as both a writer and singer—and his good looks soon also had Hollywood calling. Kris is the first to admit that he does not have the world’s greatest singing voice, noting, “Every performer that’s performed my songs has done them better than I did.” Nevertheless, his voice has an honest, sincere quality that is very appealing, and many of his own recordings have done quite well. In 1973, Kris’s prayerful ballad “Why Me,” from the album Jesus Was a Capricorn, became his first and only number-one solo country hit. Kris singing “Loving Her Was Easier (Than Anything I’ll Ever Do Again)” in 1972. In 1973 and 1974, he released two duet albums with his second wife, pop singer Rita Coolidge: Full Moonand Breakaway. “From the Bottle to the Bottom” and “Lover Please” from these albums were country and pop hits and Grammy winners. The couple released a third album before divorcing in 1980. Kris and Rita perform “Please Don’t Tell Me How the Story Ends” in 1978. Kris’s first movie appearance was in The Last Movie, directed by Dennis Hopper in 1971. Other early movie roles were in Cisco Pike(1972) with Gene Hackman, and Alice Doesn’t Live Here Anymore(1974) with Ellen Burstyn. His most prominent movie role came in 1976, when he starred with Barbra Streisand in A Star Is Born. His performance as a washed-up rock star—a role that Elvis Presley reportedly wanted—won him a Golden Globe Award for Best Actor. Songs from the movie written by Kris scaled up the pop charts. Kris and Barbra in a scene from A Star Is Born. His 1984 movie with Willie Nelson, Songwriter, garnered Kris his first Academy Award nomination, for Best Original Song Score. Other popular movies in which Kris has starred or played character roles include Semi-Tough(1977) with Burt Reynolds; Convoy(1978) with Ali MacGraw; Lone Star(1996) with Matthew McConaughey; and the Bladeseries of movies (1998, 2002, 2004) with Wesley Snipes. In the Texas Risingtelevision miniseries of 2015, he portrayed President Andrew Jackson. Kris singing his lovely “Here Comes That Rainbow Again” in 1995 with Waylon, Willie, and John on background vocals. In 2004, the Country Music Hall of Fame honored Kris with membership. Well-received albums that he has released in the 2000s have included This Old Road(2006), Closer to the Bone(2009), and Feeling Mortal(2013). Lou Reed and Kris Kristofferson: In Their Own Words with Vin Scelsa, released in 2017, is a fascinating live album recorded with the late Lou Reed in 1994. In 2016, Kris revealed that he was struggling with symptoms of Lyme disease—including neurological, muscular, and memory problems—previously misdiagnosed as dementia. The symptoms are controllable with medication. 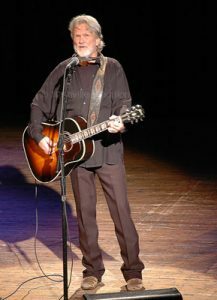 Despite the health issues he faces in his 80s, Kristofferson continues to write, record, and perform music—the unlikely career for which he gave up the world of academia more than half a century ago. Kris singing “Bobby McGee” at the City Winery New York in 2017. Neil Strauss. Kris Kristofferson: An outlaw at 80. Rolling Stone. June 6, 2016. Dana Parish. “A slow slipping away”— Kris Kristofferson’s long-undiagnosed battle with Lyme disease. Huffington Post. July 6, 2016.